"in us a stream of living water"
Epiphany begins and ends with theophany: the heavens opening and the voice of God over the waters of Jordan and upon the mount of Transfiguration, like a supernatural parenthsis around the very grounded Galilean ministry. The focus of today's meditations has to do with our participation in Jesus' Baptism. On this day we may choose to be born again (meditation one) renewed, revitalized, healed, strengthened (meditation two) that our own hearts may become for the world, streams of living water (meditation three). The holy day of lights, to which we have come and which we are celebrating today, has for its origin the baptism of my Christ, the true Light that lightens everyone coming into the world, and effects my purification�. It is a season of new birth: let us be born again! We duly celebrated at his birth � I, the one who presided at the feast, and you, and all that is in the world and above the world. With the star we ran, with the magi we worshiped, with the shepherds we were enlightened, with the angels we glorified him with Simeon we took him up in his arms, and with the chaste and aged Anna we made our responsive confession�. Now we come to another of Christ�s acts and another mystery�. The Spirit bears witness to his Godhead, for he descends upon one that is like him, as does the voice from heaven�. 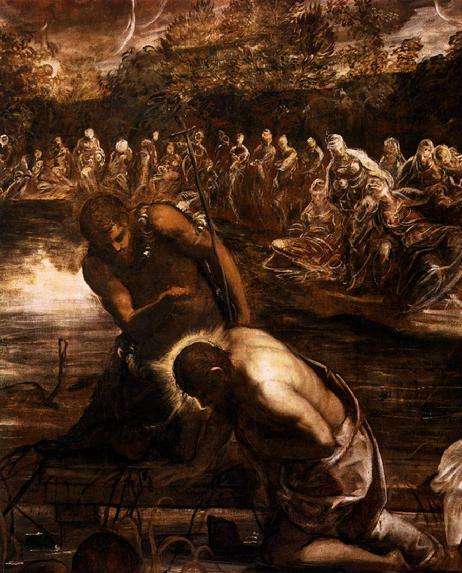 Let us venerate today the baptism of Christ. Do you remember your baptism? Many people do not. Maybe at your grandmother's insistence, soon after you were born, your parents and godparents got you to the font while you still fit into the family Christening Gown. In the liturgical tradition to which I belong, baptisms tend to take place at the convenience of out-of-town family, but ideally we welcome new members into the body of Christ four special times a year : The Great Vigil of Easter, Pentecost, All Saints Day, and the Baptism of Jesus. These four feasts offer Christian communities a regular chance to re-examine, reflect upon, and renew the grace of the sacrament, and even if there's no baptism that day, a bowl of water and the Paschal Candle, dominates the space. We might even get wet. The renewal of vows also serves as an invitation to remember your own soul's initiation into the mysteries of the faith. Four times a year? Why not? For the deeper the journey, the more profound the layers of meaning behind this Christian initiation by water and spirit. I'm grateful for this. I can ask myself, How am I doing? The purpose of any initiation rite in any religion is to once and for all overcome the fear of death. Dionysius, Osiris, Mithras, were Mediterranean gods who died and rose again from the dead. The rites simulated death, so that the initiate would fear no more - indeed, the adept would live into a full, mature human experience. He pitched backward into a pool of water to whose edge the furious combat had brought them. And there he lay, unmoving, while the monster roared its victory cry and Una, watching from afar, wept strickenly at the fall of her hero. But it was no ordinary pool into which the knight had fallen. Its waters had rested in that land from earliest times, and its virtues had resisted even the dragon's foul presence. It was called the Well of Life, and had the power to cure the sick, to cleanse the sinful, to rejuvenate the aged, even to revive the dead. So, after a night of mourning and prayer, Una was stunned with joy to see her champion arise from the pool just as the sun rose to brighten the land. The knight seemed as if he had been reborn and baptized anew- his armour and weapons shining, his strength restored and enhanced. a source welling up in eternal life. so that we may give life to those who are thirsty. Those who believe in Jesus will become like him. that they have received from Jesus. and will give them life, love and peace of heart. 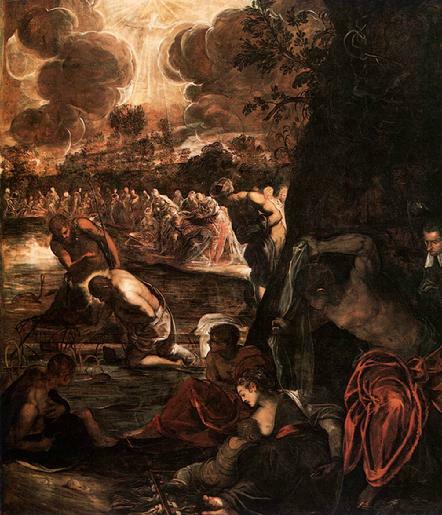 Christian Baptism also simulates death, going down into the water to drown, to die, to enter the underworld, or the Unconscious. Bursting up out of the water represents birth, from the semi-darkness and muted sounds of the water-filled womb, to the harsh (at first) brightness of new life, the struggle to breathe air, to live in a completely new medium. With the Samaritan woman I say, “Give me some of this water!”(Jn. 4:15) Let me come from the waters not only cleansed, renewed, reborn, but let me try to comprehend that this “living water becomes in them a spring of water gushing up to eternal life.” 'Within them'! Within me! Within us! I don't remember my baptism on Epiphany Day just short of my first birthday. (My parents must have forgot, having inherited the gown for my own children, it barely fits a one year old!) As for me, I'm forgetful of this eternal gift in the messiness and busyness of daily life. The living stream lives most of the time as a dormant, dark pool at the bottom of the deep well of my soul. Let us go down to the waters!